challenge to legality of consultation. It turns out that the proposed new sponsors for the Islington Green Academy, now that ARK have withdrawn their support are heavily linked with Freemasonry. Please read our press release. Planning permission for the St Mary Magdalane Academy was granted on 27th September and clearance and building work on part of the site is due to start shortly. Demolition work is due to commence at the site on 7th November [NB not 24th Oct as previously advised], demolishing Dorinda Lodge, First Steps Nursery, Milton Skills Centre, surrounding on 3 sides the Rosedale Early Years Centre which is to remain open during the next 12-15 months construction work. Construction of the new buildings will start in Feb/March 2006. Crossley Street, the other on Liverpool Road. Both residents are concerned about the negative impacts that the new Academy will have on their local environment, which do not appear to have been addressed by Islington Planning in granting permission for the development. In particular, the development site immediately adjoins the St Mary Magdalene Church Gardens Conservation Area and also affects the setting of both statutorily listed and locally listed buildings, including the St Mary Magdalene Church and others in the immediate vicinity, some of them residential/occupied. The Islington Planning officer did not address the special attention to be paid by a local planning authority in the circumstances of the surrounding conservation area, nor to the settings of local listed buildings in relation to new build developments. failure to consider these material considerations in the process of resolving the case means the permission granted was fundamentally flawed and subject to be revoked by the courts. This is the major flaw in the consent granted that evening. Islington Council's Legal Department have been sent a letter by Leigh Day solicitors requesting the withdrawal of the permission at an early stage. The London Diocesan Board for Schools has been advised by Leigh Day solicitors not to take any steps to implement the permission until the legal matters are resolved. Whether LBI Legal Dept or the Diocese agrees to stay their hand and consider the legal and procedural issues is a matter for each of them. If they choose not to, Leigh Day solicitors acting on behalf of the claimants will be left with no option but to commence proceedings for judicial review as soon as possible and to seek a stay to prevent any steps being taken to implement the permission until it is resolved in court. 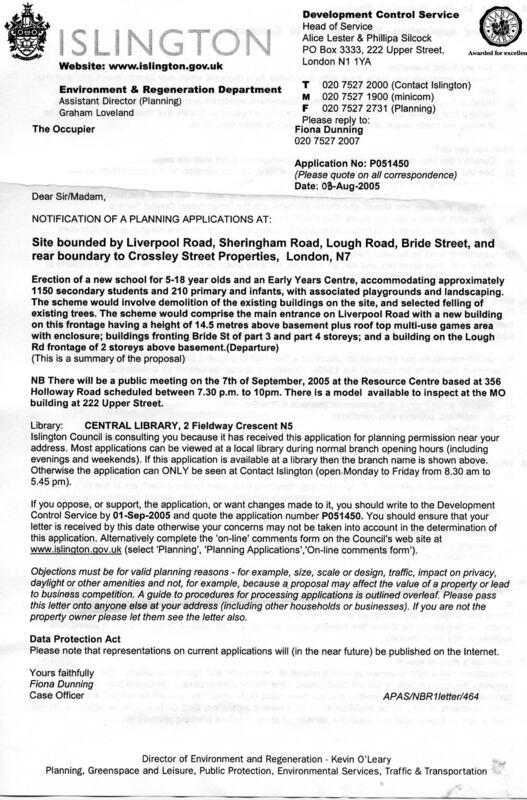 Despite opposition, this application passed the planning stage on 27/9/05. Formal consultation on the planning application to demolish St Mary Magdalene Primary School and rebuild an Academy on the site has begun. It is surely coincidental that the three week period, beginning 8/8/05 is timed for the time when most families are likely to be away. The Planning consultation is a statutory 21-day period running from the date of the consultation letter up to 1st September by which date all comments have to be received by the Council. 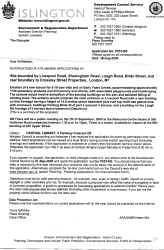 The letter has been distributed to nearly 5,000 properties around the site. However, representations will be valid right up until it is too late for the Planning Committee members to be able to consider them - i.e. up to the committee date which is likely to be around 29th September. There is also a public meeting after the end of the formal consultation deadline, to be held on 7 September at 7:30 p.m. at the Resource Centre, 356 Holloway Road (next to Waitrose). This is in addition to the notification and consultation exercise, and is a further opportunity for interested members of the public to see the plans and ask questions about the scheme. Apparently comments and views expressed at this meeting will also be taken into account by the Council in deciding whether to approve or refuse the application. The Planning Officer is Fiona Dunning who is contactable for queries at any time on 020 7527 2007. Plans are viewable at 222 Upper Street or at Central Library on Holloway Road. Comments can be made by letter (to Fiona Dunning), by email (to development.control@islington.gov.uk ) or by Online Comments Form at http://www.islington.gov.uk/Environment/Planning/Applications/CurrentApplications/1230.asp or go to 'Environment', 'Planning', 'Advice on Planning Applications', 'Current Planning Applications', 'Have Your Say on a Planning Application' on the LBI website. Please always quote refence P051450. NB: Please note that if you wish to comment at this stage, cooments and/or objections should be for "planning reasons" rather than overall desirability: local amenities, services in the area and the impact on them, noise, number of people who over-see the site or anything else you may feel is relevant.